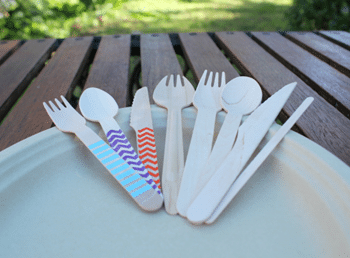 We all know that traditional disposable tableware adds a lot to landfill. It is usually not biodegradable and as a result, when used by patrons at cafés and restaurants it contributes to the worsening of the environment. By reducing the carbon footprint, you are showing customers you care. The great news is there are green tableware alternatives which are compostable, using renewable resources and less energy to make them. 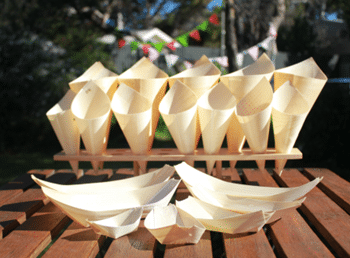 Eco Party Box, an Australian company, makes these available for you. Not just tableware, your kitchen can be green too. Use recyclable cotton tea towels and wipes instead of disposable one. Freshly laundered at state of the art plant, Alsco supplies these to thousand of restaurants throughout Australia, taking back their dirty linen for a wash. Visit alsco.com.au for more tips on making green choices in the workplace and to get a free quote for your workplace. Australians use over 1 billion coffee cups every year. 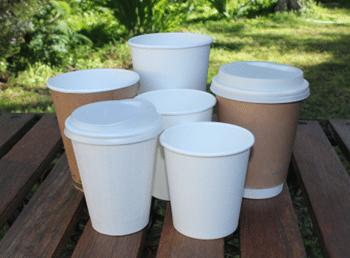 Biodegradable coffee cups are compostable in a commercial composting facility, as they are lined with PLA, a substance derived from annually renewable plant-starch instead of plastic. 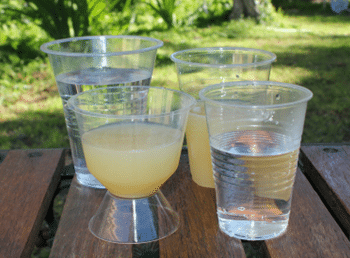 PLA clear cups and goblets are also made from polylactic acid. Unlike standard plastic cups they will break down in a commercial composting facility. Cups come in a variety of sizes and the goblets come as two pieces which are put together. 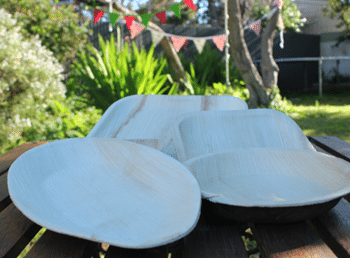 Bamboo pulp plates and bowls are home compostable. They have a natural light-brown texture which makes them a popular green choice. They come in a variety of shapes and sizes, including small round to large oval plates. Gourmet pine boats are terrific for side dishes or appetizers. Gourmet pine cones are popular at parties and cafes for holding hot chips and are also terrific at weddings, for holding confetti and rose petals. 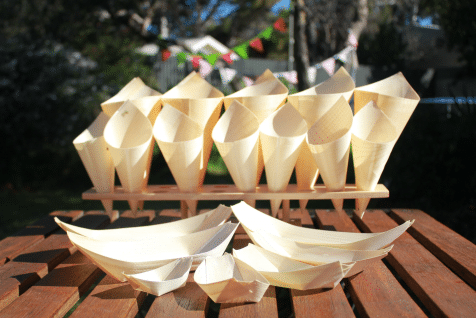 Made from Forest Stewardship Council (FSC) certified plantation birch, the boats and cones are delicate and yet robust. They have an elegant and clean look and are water & heat resistant and compostable in a home composting facility. Areca Palm Leaf Plates are made in India from the naturally-fallen outer sheath of the betel nut palm tree. There is no chemical process used in their manufacture, they are simply cleaned, steamed and pressed. They are very popular at weddings and corporate events. They come in a variety of sizes and shapes. Wooden cutlery. They are made from plantation birch, which is compostable. The range includes forks, spoons, knives, sporks, tea spoons and stirring sticks. PLA Cutlery. 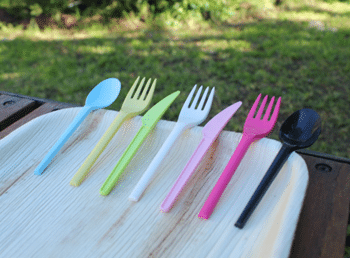 The ‘Green In Every Colour’ range of CPLA cutlery is Australia’s only colourful compostable cornstarch cutlery. It is biodegradable in a commercial composting facility. Made from CPLA, a derivative of naturally-grown corn starch, it uses non-toxic inks. 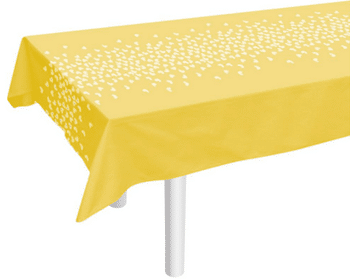 The world’s only bioplastic tablecloth is compostable in a commercial composting facility. Made in America by Susty Party, it is bright and colourful as well as reusable. 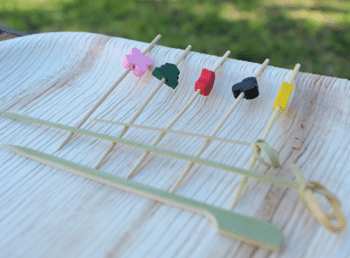 Made from bamboo or plantation birch, wooden skewers are terrific for finger food at parties or events. 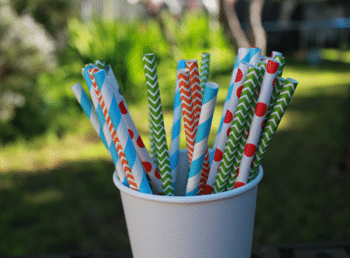 Paper straws are made from food-grade bleached paper and are coloured with FDAapproved food-safe ink. They come in a variety of designs and colours. PLA straws are made from a bioplastic derived from plant-based starch. 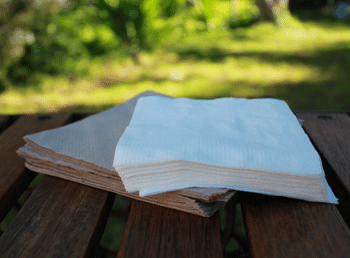 Recycled napkins are unbleached and made from 100% recycled fibre, meaning that no trees were harvested to make them and the materials used to make them aren’t filling up landfills. They can be recycled or home composted. Sugarcane and Bamboo Mix Napkins are made from sugarcane / bamboo mix fibres. They are tree-free and environmentally friendly. They can be recycled or home composted. Both types of napkins come in cocktail and lunch napkin sizes. Eco-friendly tableware products come in a wide variety of tastes and styles. 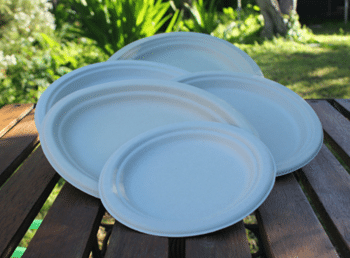 Not only are they better for the environment, they look and feel more natural, rather than the cheap, easily discardable style of most other disposable tableware. Eco-tableware is ideal for events as well as to-go options for cafe and restaurant customers. By showing they are environmentally conscious businesses can build greater rapport with their customers and keep them coming back, knowing they are a venue that values the environment. The other benefit is that they are now price comparable to traditional disposable tableware. Want some bulk discounts? Log in to the wholesale section of ecopartybox.com.au. Alsco would like to thank Eco Party Box for this article. Eco Party Box offers a wide variety of eco party supplies and eco tableware that is an excellent choice for cafes and restaurants. From compostable coffee cups to bamboo pulp clamshells, Areca plates, wooden cutlery and much more. They also stock decorations, children’s party bags and favours, party games and activities and more. For more information, visit www.ecopartybox.com.au. Alsco also offers environmentally-friendly options through its recyclable cotton wipes and tea-towels. Check out more about Alsco’s range of linen products. Enquire now!